Hungarian designer Krisztina Czika's cups might resemble familiar IKEA mugs but they're actually made from human hair embedded in wax. 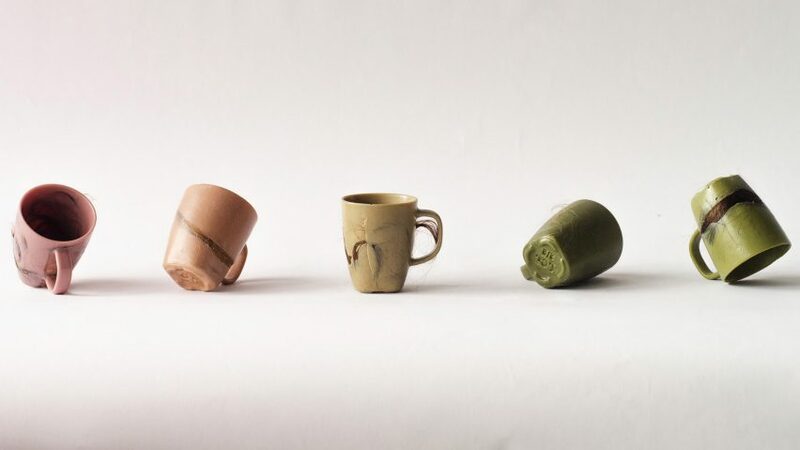 Czika, who completed the project as part of the DesignLab course at Gerrit Rietveld Academie, harvested hair from four donors, including herself, to make 15 mugs. She used different colours of cosmetic wax – which is typically used for removing leg, underarm and bikini hair – to make the collection, which she named This Is Not A Värdera, after the ubiquitous IKEA cups. "Materials that are readily available and require the input of the human body creates a new way of perceiving even an IKEA mug," said Czika. The designer used a silicon mould to shape the mugs, placing a layer of hair in first before filling it with liquid wax, which takes half an hour to cool down. According to Czika, the cups take a few days to completely dry out and become smooth. The final mug is as fragile as glass, and not intended for everyday use. "Human hair and cosmetic wax both have the qualities to be recycled, and contribute to an upcycled production that could be beneficial to our economy," added Czika. Studio Swine also experimented with the possibilities of hair as a material, infusing it in resin to make a range of home accessories. The mug collection is part of the designer's ongoing explorations into human hair – which have included shaving her own head and spinning it into a ball of thread. "My intention with this project was not to propose or to provide possible applications, but to increase awareness," she told Dezeen. "As an artist in the luxurious position of being able to access raw materials in bulk, I am losing my connection to time and space, and an appreciation of where certain materials come from." "I wanted to reflect on what would happen if human hair could be used in mass production," she added. According to the designer, the added fragrance in the cosmetic wax gives the mugs a "pleasant" smell, although she also admits that most people's first reaction is one of disgust. "When they take it in their hands and smell it, the first question is always, 'Can you drink from it? '", she said. "And I am eager to ask back, 'Would you like to drink from it?'" The collection was shown at OBJECT art fair in Rotterdam, which took place from 10 to 12 February 2017. Photography is by Anne Lakeman unless otherwise stated.